Our 2013 winning cover models high fashion editorials was shot by celebrity photographer Peter Baratti! Peter is a 25 year veteran photographer shooting for such magazines as Vogue, Elle, Glamour, Cosmopolitan, Vanity Fair, Bazaar, Sportswear Illustrated ‘Swimsuit Edition’ and dozens more! His portfolio includes many famous faces including supermodels Cindy Crawford, Claudia Schiffer, Christy Brinkley, Christy Turlington, Gisele, Amber Valetta and many more. Peter has also shot celebrity faces such as Eva Longoria, Jennifer McCarthy, Penelope Cruz, Jennifer Connolly, Blake Lively and more! On a note close to Bella Petite, Baratti was also Ann Lauren’s first photographer, sent by the Ford Agency in LA to test with Ann when she began her career. Baratti’s nickname for Ann Lauren at the time was “Bella Petite,” and now he’s the lead photographer for Bella Petite Magazine! At the shoot, we had a fantastic professional makeup artists and hair stylists crew on location from Beauty Touch by Liana (BTL) in West Hollywood, California. The BTL team was led by owner operator Liana Arapetyan. The energized atmosphere was fast paced and on cue from the start. Liana took charge of her crew of ninja stylists with work stations set up ready to prepare any look that we desired. There was no question that they could do it all and they delivered! Their motto “you don’t have to go far to look like a star,” was absolutely true! There is no question, our petite models shined like stars! Photographer Peter Baratti started shooting with Bella Petite Lifestyle and Yoga expert Dashama for an editorial comprised of fitness and yoga shots. This fabulous editorial will feature yoga poses by Dashama with Ann Lauren and petite cover models, Heidi, Lauren, Samara and Jennifer. From there we prepped Jennifer Monge for her high fashion editorial with a glamorous Bollywood-inspired theme. She wore an Indian saree gown designed by Shekhar Rahate Couture. To complete the look she wore Accessories by Rohini and she looked amazing! The final shoot of the day was a Great Gatsby theme, updated for the 21st century. This editorial features celebrities Ann Lauren and Dashama with Bella Petite Magazine cover models Heidi, Lauren, Jennifer and Samara. The models and talent wore gowns from Shekhar Rehate Couture, Glamour Garden by Silva and Accessories by Rohini to accentuate the glamorous scene. The shoot ended with sponsored gifts being given to the models! Bella Petite Magazine cover models Jennifer, Lauren, Samara and Heidi each received custom designed and printed posters, along with cosmetics by Anastasia Beverly Hills and jewelry by Jeffrey Appling. Bella Petite Magazine celebrated the successful shoot with a wrap dinner party at BOA in Beverly Hills, and this was truly a phenomenal experience for everybody! 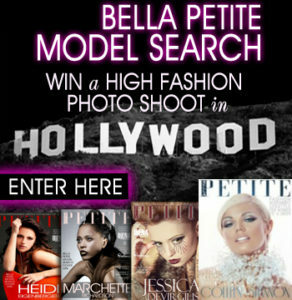 Enter Bella Petite Model Search! Join Bella Petite today and be part of the petite fashion and model movement. Hi,OMG… HOW DO I ENTER TO WIN THE FREE EDITORIAL PHOTO SHOOT? Hello Sakethelya, all you have to do is enter the Bella Petite model search. Click any of the above banners or text links above. Or click the sidebar banner for the model search. Good luck! Love what you do thanks for the hard work and efforts! Fabulous shoot! It looked like everyone had a great time!